David Singh has worked both Olympic and world Junior Hockey Tournaments. Photo Elisa Barbier. 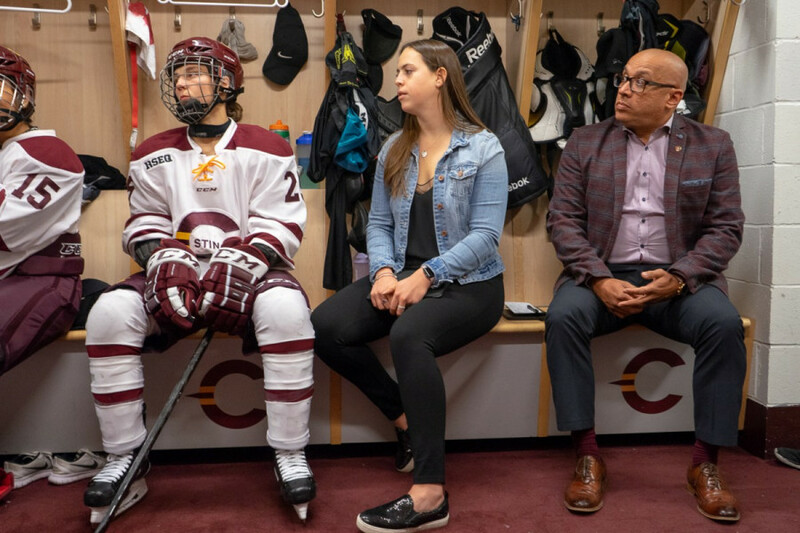 In 2016, David Singh joined Concordia’s women’s hockey team as a part-time assistant coach, adding to his already extensive list of professional and volunteer experience. That list includes, among other things, four years of coaching in the National Ringette League, over ten years as an International Ice Hockey Federation official, and, more recently, head coach of Team Quebec’s ringette squad heading into the 2019 Canada Games—and all of this while maintaining a full-time job. While Singh may make juggling all of these obligations seem simple, he says it’s definitely not. He said being a university-level coach with his other occupations requires time management and planning down to the wire to make things work. “I think what helps is that I don’t have kids, and my wife is really understanding about me being away sometimes,” said Singh. Singh’s wife is a teacher and he said she understands his passion for coaching. While he may be passionate, Singh and his wife both know that this won’t last forever. Singh cut down his commitments significantly, focusing on Team Quebec, Concordia, and his job. “Another really helpful thing is that while Concordia practices everyday, everything is in the mornings so I can come down and be at practice at Concordia and then go on with the rest of my day,” he explained. Singh has since transitioned from one full-time job to another. His old job allowed him to work from anywhere, making it easy to answer emails on the bench and then head to the office after practice. Bob Longpré, president of Lac St-Louis Ringette Association, has known Singh for over 15 years, and said that Singh has always been able to manage his many commitments. “Given everything that he’s into, I’ve never seen him falter or get into a situation where he couldn’t be somewhere he was supposed to be,” said Longpré. Singh’s roots as a coach began with ringette. He’s been involved with Lac St-Louis for over 30 years now. He got into the sport because his younger sisters played, starting first as a timekeeper, before moving onto officiating and then coaching. He’s been coaching ringette for most of his life and it’s what lead him to the Stingers. McGrath knew about Singh’s background in hockey both as an official and as a coach, and that Singh was unable to coach ringette at an elite level for a while, because of his involvement with Team Quebec, so he suggested he come to Concordia. McGrath told Singh about an open spot on the Stingers’ coaching staff, and it built from there. Singh was interviewed by head coach Julie Chu and McGrath and has been with the team ever since. Singh has a wealth of experience in the worlds of coaching and officiating. Having been an NHL and IIHF official—most recently at the 2017 World Juniors in Montreal and Toronto as well as the 2010 olympics before that— Chu said he sees the game a little differently, and understands how to communicate with the officials on the ice. 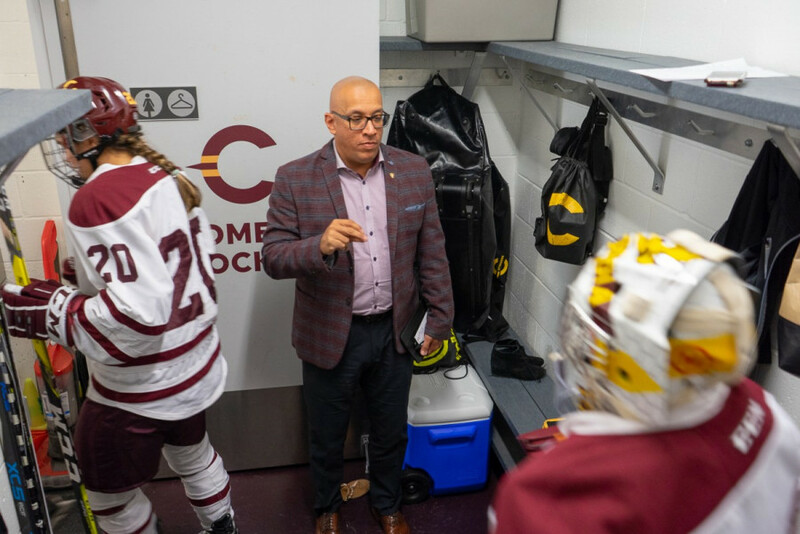 Singh spent time coaching boys hockey at the AA and Midget Espoir levels, but he feels there’s something about coaching girls and women that he connects to, which he’s been able to apply to his time as a ringette and Stingers coach. “The thing I like the most about ringette is working with female athletes,” he said. He feels that the problem with boys’ hockey is that everyone thinks they’re going to make the NHL, which isn’t the case for most young players. He also notes that the approaches in coaching women differ from coaching men. In his experience, he’s noticed that women tend to ask different questions. Singh said he’s adapted his coaching style over the years and knows his role with the Stingers as a coach and mentor. Singh notes that while he may not be involved as much on the technical side, his contributions come in a less tangible form. Singh has been a big part of the Stingers’ back to back runs to nationals. Photo Elisa Barbier. This is one of the first things Longpré noticed about Singh’s style upon first working with him. Longpré said Singh’s coaching style is a matter of give and take. He respects the players for their hard work and dedication, and in turn they respect his knowledge and emotional strength. This is what’s helped him to bring the best out of each player he works with, Longpré said. From being an official in ringette and hockey, to coaching ringette, and his work with the Stingers, Singh has done it all. His next challenge is just ahead, as he prepares Team Quebec’s ringette squad for Canada’s 2019 Winter Games. The team has been working with him over recent months, settling into a packed training schedule. Singh says that when the Canada Games come wrap up next March, it will likely mark the end of the ringette chapter of his life.